"These Mexican Wedding Cookies with chopped walnuts are a sweet treat for any occasion!" Combine shortening, 1 cup powdered sugar and vanilla in bowl of electric mixer; beat on medium speed until well blended. Combine flour, baking soda and salt in medium bowl. Add to creamed mixture; mix well. Stir in walnuts; mix well. Roll dough into walnut-size balls; place on ungreased baking sheets about 1 12 inches apart. Bake 15 minutes or until edges begin to brown slightly. Cool on baking sheets until cool enough to handle, but still warm. 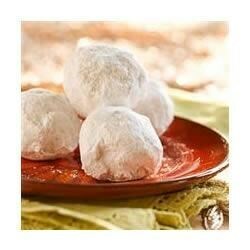 While still warm, roll in remaining 1 cup powdered sugar; place on cooling racks to cool completely. See how to make classic chocolate-chip cookies. Anything with powdered sugar on it is a hit in our house. I sometimes use extra vanilla for a richer taste. Love these , I change it up and add cinnamon to powder sugar and roll them in that . I also add fresh ground nutmeg maybe 1/8 tsp . Have made these many times. Personal preference calls for pecans instead of walnuts. Great recipe!